The president visited a memorial to the 1976 military coup. Walking alongside Argentine President Mauricio Macri through the memorial, the leaders reached the inscription of Fernando Brodsky, where they were met by Fernando's brother Marcelo Brodsky. The trio continued through the memorial, pausing at the name of Toni Motta -- an American journalist who disappeared during the violence. The presidents were handed small bouquets of white roses and walked onto a pier, where they tossed the flowers into the river where many of the victims were drowned. 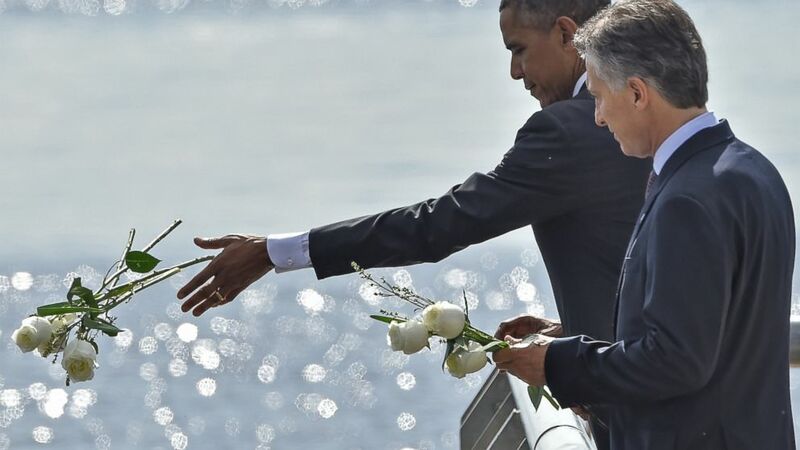 (Nicholas Kamm/AFP/Getty Images) President Obama and Argentinian President Mauricio Macri throw white flowers into the River as they pay homage to Dirty War's victims at the "Parque de la Memoria" in Buenos Aires, March 24, on the 40th anniversary of the 1976 military coup. Obama said the United States government would declassify U.S. military and intelligence documents related to the "Dirty War," at the request of Macri and human rights groups. Opened in 1997, the memorial is located alongside the Río de la Plata in the Belgrano neighborhood of Buenos Aires. The primary structure in the park is the Monument to the Victims of State Terrorism, a long wall -- similar to the Vietnam War Memorial in Washington, D.C. -- inscribed with 20,000 names and ages of victims. An additional 10,000 empty plaques represent victims who have not been identified. The wall is connected to a jetty that extends into the river, commemorating those who disappeared at sea.